When a book is set in New York City, I’m always immediately intrigued. And when that same book is clearly loved by a close blogger friend, then I usually bump it up to the top of my reading pile. Someday, Someday, Maybe was riding on a wave of fervent praise from a few friends when I started reading it. I was afraid it couldn’t live up to the hype, honestly, but I really enjoyed it. Franny’s narration was funny and easy to relate to, and I found myself finishing the book in one sitting in my eagerness to find out what happened to her next. Even though I didn’t fall head over heels for this book, it’s definitely one of the better books that I’ve read this year. When it comes right down to it, the reason that I really liked this book was Franny. She’s such a wonderful character, with charisma, frankness and sense of humor that leapt off the page. Her experiences as an aspiring actress trying to come by her big break in the Big Apple were really interesting, funny and felt very real. Franny kept up a running commentary that amused me greatly, and it often made me chuckle to read it! Even though I’m not an actress, I could relate to Franny’s struggle to balance her passion and her practical needs (like money to pay for basic needs). New York is both a wonderful place to be and a challenging place to live, and Graham successfully shows us that in Someday, Someday, Maybe. This, in fact, is the part of the book that really and truly had me invested in the story, as I currently experience that conundrum for myself! Franny’s journey has its fair share of difficulties and desperation and frustration, but in the end, it is her determination, her passion and her willingness to get up and keep trying that see her through. In a roundabout way, this book reminded me that, no matter how long it takes, there is always hope for your dreams to come true. The cast of characters surrounding Franny is of the eclectic variety, which makes sense with the New York setting and her actress aspirations. I particularly enjoyed her interactions with her roommates Jane (who has been her best friend for ages) and Dan (who I immediately loved because of his writing aspirations, and later on, I realized he reminded me of the character of the same name from Gossip Girl). While we don’t witness too many moments with either, it’s a lot of fun whenever any of them are together. However, even though I loved Franny and could relate to her journey, I also felt slightly set apart from her. Instead of feeling like I was walking in her shoes or alongside her, I felt like I was listening to story being told to me by the friend of a friend. This small disconnect is the reason that this book didn’t progress from the level of like to love for me. 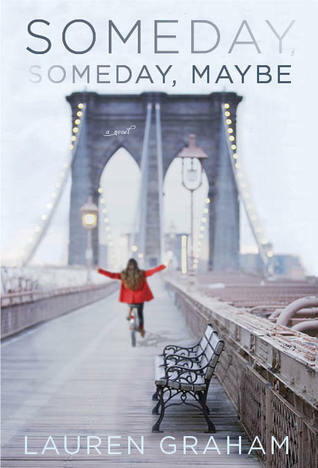 Someday, Someday, Maybe is the story of a girl in her twenties who is trying to chase her dreams in one of the greatest (if not the actual greatest) cities in the world, New York. While I found the general gist of Franny’s story particularly relatable, I was a bit disappointed that I didn’t connect more with her. Still, this story is entertaining, fun and really likable, and I certainly wouldn’t hesitate to recommend it as a good adult contemporary novel. This book = <3 I couldn't have asked for anything more from Lauren Graham with this book! I adore her, and I felt like this book totally portrayed who she is! I loved Franny, and pictured her as Lauren all along the way. Glad you liked this book! I was wondering if you were planning to read this one, as I know you love NYC books! We're actually doing a book club reading of this on The Broke and the Bookish in June, so I'll be reading it with the other ladies. We'll post our book club chat on the blog at the end of the month. I've been excited for it, but am now also concerned that I won't be able to connect with Franny since you didn't. We tend to have the same thoughts about books. I guess we'll just see! Great review, as always! This is going to sound lame, but I'm starting to wonder if I'm "too old" for this book. Probably not, but isn't that a sad thought? I LOVE books like this, despite not reading them more. And I LOVE Lauren Graham. So... yeah, whatever. I'm reading it. Thanks for letting me talk it out! This is a fantastic review. I hate that you didn't connect to Franny more, but love that you were able to relate to her struggles and life in NYC! I'm glad that for the most part you really liked this book. I picked it up from the library last week, and am pretty excited to read it. I wasn't exactly sure what to expect, though, because it's LAUREN GRAHAM. And although I LOVE her in Gilmore Girls, I wasn't sure how she would do writing a book. I definitely need to dive into this one, soon. Thanks for the review. Yay, I'm glad you liked this overall, even though you had a small disconnect to the story! :) I agree that Franny's character was amazing, and I think she really made the book for me. I also really liked her dad's voicemails, though I wished we actually got to seem him more. He seemed like a really cool guy. I really liked this story ... I was a little hesitant since it was written by an actor (one of my favourites), btu was pleasantly surprised! I already wanted to pick this one up bc its Lauren Graham, but after your review, I wanna read it more! Its a shame you didn't connect with Franny as much though. I hope that doesn't turn me away from it when I get around to reading it. Great review!